Authored by broulik on Apr 17 2018, 11:37 AM. The "Default" theme option has been dropped in favor of having the "Defaults" button revert the selected theme to Breeze. While technically the old code made it read the hardcoded default colors in KColorScheme (which cause the window decoration to turn blue as it cannot write into KWin config like the theme files can), this change makes most sense from a UX POV. The "Current" theme option has also been removed. Technically, when applying a theme the colors are copied into kdeglobals, so you could have a custom theme that is not an actual .colors file on disk. However, this is imho quite a niche usecase. Ideally, we showed a "Custom" theme as soon as the actual theme diverges from any theme file installed but that would require tediously comparing dozens of settings values which I don't think is feasible. At least when the color scheme name set in kdeglobals does not exist, a warning is now displayed. The "Apply to non-Qt applications checkbox" which isn't something one would want to uncheck has been removed. It is still read from kcmdisplayrc for those who really want to disable it but there is no user-visible checkbox anymore. When editing a system scheme, upon clicking "Save" the user is prompted to type a new scheme name. This ensures that any custom scheme is always present on disk reducing the need for a "Current" entry. 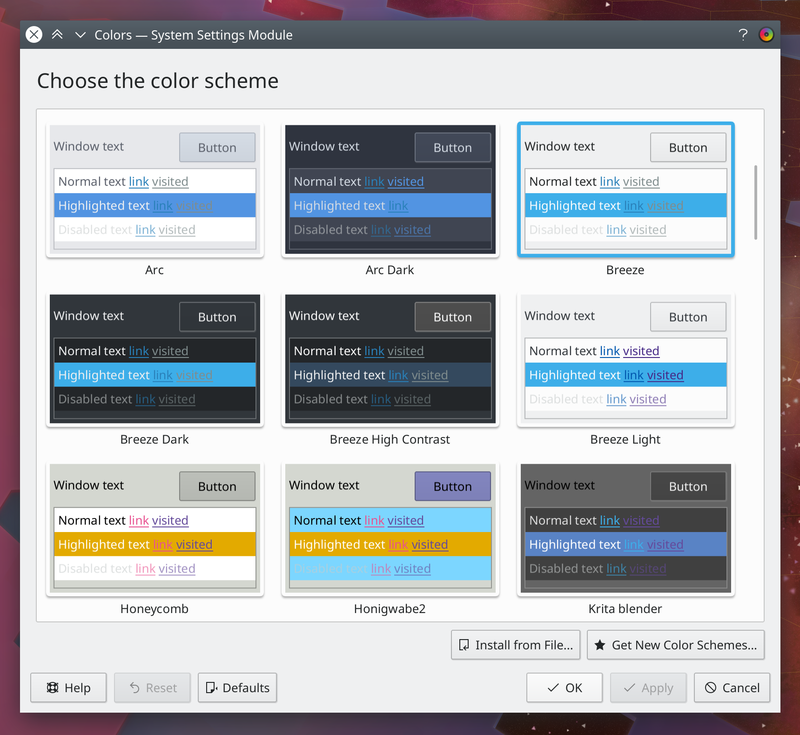 When the dialog is then closed, the newly saved theme is selected. The rewrite also comes with all the goodies we got in the other new KCMs, such as the ability to drop a .colors file into the view to install it or undo deletion until you apply your changes. 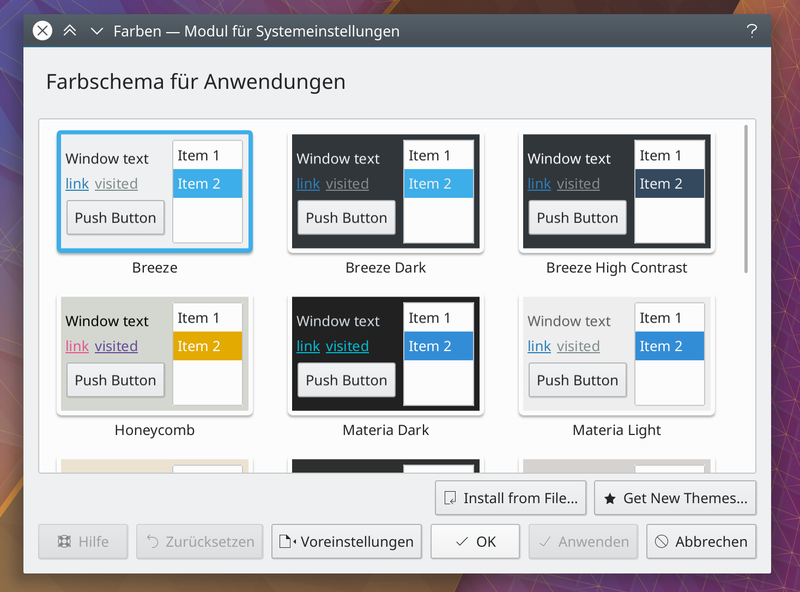 KColorSchemeEditor lacks an OK button so when launched from the KCM you always have to do Save/Apply and Close instead. Not too fond of this "Current"
me neither, if it was up to me, I'd just show a prompt asking for a name when you click "edit" on a system scheme. Would be nice and simple. but it was redone by Marco quite recently and still kept. So clearly for a reason? It would be really cool if the delegates would show a little preview of a window actually using these colors, instead of the current grid of colored squares. ngraham added a task: T7243: Colors. Does this setting even still work? 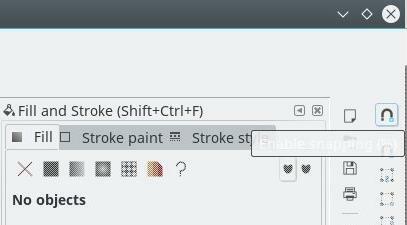 I believe support for it is spotty to nonexistent in today's GTK3 apps. I would be in favor of removing the control from this page and turning the setting either on or off by default, and relocating it to somewhere more hidden if necessary. it's probably not trivial with how colors are done in qqc2 right now.. i plan to add more custom colors for kirigami, but non essential for now? -1 for "current" here too. I also don't like "Default" either. What does that even mean to a regular user? Yes, definitely non-essential. A nice-to-have, not a need-to-have. That basically reloads the "no config" case hardcoded in KColorScheme. I think we should drop that and then make sure the "Default" button works well (as in: select Breeze). Should I be working on mockups to address comments? One was about not using a color palette. Hmm, I'm not sure those white strips communicate "This is what text looks like." I think some sort of placeholder text would work better. To be honest I kinda liked the first one better, but I think it's mostly moot until we can show a real window or view preview. Beautiful! Could we move the pushbuttons over like 2 pixels to the left so they're vertically aligned with the labels above them? 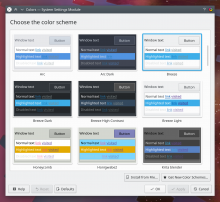 what about having this with just color boxes on 5.13 and then figure out controls tinting in 5.14? Ping? Is this KCM doing alright? Can you use an initializer_list here and elsewhere? This removes the "Apply to non-Qt applications checkbox" which isn't something one should uncheck. 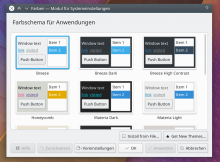 I think it is not needed, because the GTK 2 theme already defines which colors are used and that should not be overwritten because of the issues. If we remove the checkbox for this, then it needs to be off by default so people stop hitting https://bugs.kde.org/show_bug.cgi?id=355540. If we remove the checkbox and don't include a way to turn off the setting, then there is no way to recover from that bug. broulik retitled this revision from WIP: [Colors KCM] Port to new design to [Colors KCM] Port to new design. Better: "Choose the color scheme"
Better: "This module lets you choose the color scheme." what would happen if this is called twice before the file_copy completes? It seems these should be standard across all GridView KCMs. It's amazing to see all the work that was done here. Thanks everyone for working together on this. I hope our users see this new KCM as a step forward. Did this land in Plasma 5.15 on purpose or was it a mistake?